Sapporo and Otaru Kurisumasu Shopping & XMAS Lights Weekender Tour 2019-GUARANTEED! arrow_backPrevious Nextarrow_forward Sapporo and Otaru Kurisumasu Shopping & XMAS Lights Weekender Tour 2019-GUARANTEED! Each month there are fascinating events in Sapporo and November is filled with festivities. Be it the White Illumination that highlights the beauty of winter in Sapporo or the German Christmas Market offering a taste of European flair, it’s all here! Enjoy two illuminations, the Sapporo White Illumination, the oldest illumination event in Japan, with a history of over 30 years and then Shiroi Koibito Park for their annual Kurisumasu illumination. The month long German Christmas Market, started in 2002 when the city marked the 30th anniversary of its sister-city ties with Munich, Germany is always a fun filled. Stalls selling Christmas items, hot wine, and German food are set up at Odori Park. There are also outdoor concerts, indoor workshops, and if you’re lucky you might receive a gift from Santa Claus! 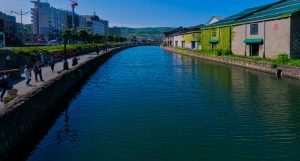 It’s only the beginning as we also include a day trip to Otaru, where you can walk along of the rows of antique buildings that will whisk you back in time. Enjoy walking along Sakaimachi Shopping Street where time seems to slow down as you meander through glassmakers, seafood shops, bakeries, sushi restaurants and as the street ends, the Music Box Hall, a must stop. We have included not one, but two sake brewery visits, Chitosetsuru Sake Museum in Sapporo, and the Tanaka Sake Brewery in Otaru and a hands-on music box making experience. All offer unique one-of-a-kind holiday gifts to share with friends and family. Four nights at the Century Royal Hotel Sapporo. In flight meals, breakfast daily at your hotel. Final payment due by September 20, 2019. Package is non-refundable after this date. Starting from $1,795 per person double or triple occupancy. Starting from $2,049 single occupancy. 11/26/19 – Depart Honolulu on Hawaiian Airlines flight 441 at 12:35 pm and arrives in Chitose at 5:00 pm, 11/27. 12/01/19 – Depart Chitose on Hawaiian Airlines flight 442 at 7:45 pm and arrive Honolulu at 7:50 am. (same day).